Just one statement cape wasn&apos;t enough! Stepping out for the first time since her glam New Orleans wedding, Solange Knowles hit up Art Basel in Miami Beach on Wednesday, Dec. 3—and you know she was wearing the only ensemble that could have possibly followed up her stunning caped wedding dress by Kenzo. 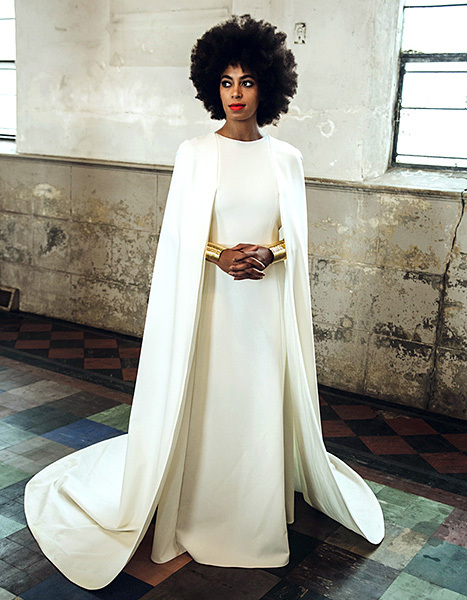 PHOTOS: See Solange's wedding album! Beyonce&apos;s sister, 28, attended—and even took the stage at—the IWC Schaffhausen &apos;Timeless Portofino&apos; event in lemon pants and a matching strapless top, complete with a ruffled train, keeping the superhero accessory trend alive and well. The mom to Daniel Julez Smith, Jr., 10, accessorized her sunny look with golden accessories—bangles and heeled sandals. 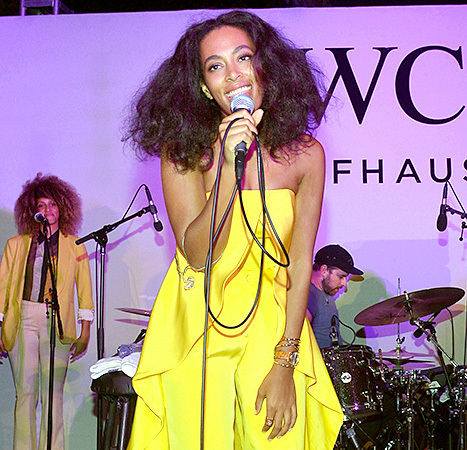 Solange kept her makeup minimal, and let her natural curls bounce free as she sang and danced for the audience. The bold two-piece brought to mind the singer’s wedding dress, a plunging ivory stunner with a dramatic long cape train (as seen on Vogue.com), which she wore to tie the knot with Alan Ferguson in NOLA on Nov. 16. While Knowles was performing at the evening event, celebs like Emily Blunt, Adriana Lima, and James Marsden milled about, eager to start shopping the annual art show&apos;s famed collection. "I just got a new house, and I don’t have a single piece of work on my walls. I’m trying to decorate my whole house in two days," Marsden, 41, jokingly confessed to Us Weekly. "I’m not a collector, but I aspire to be."